Have a hankering for handmade tacos, enchiladas, or nopales? 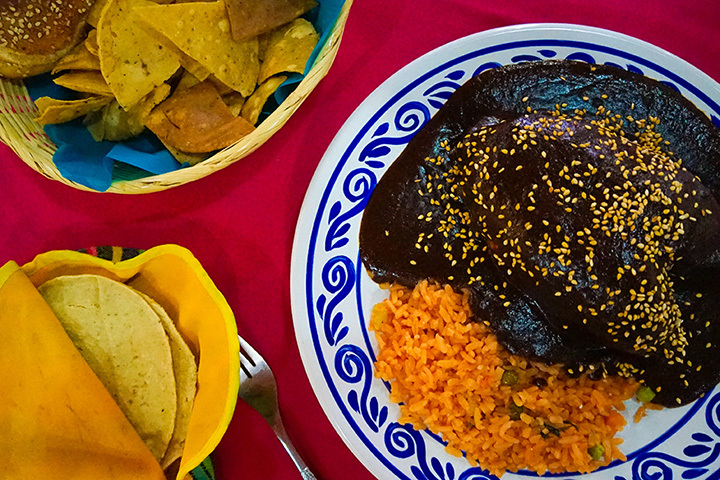 In New Jersey, there is a strong presence of authentic and creative Mexican food. The Garden State’s hungry diners can feast on everything from artisanal tacos to Mexican fusion, and home-cooked dishes following an old family recipe. Come hungry! If you love a good taco, Folklore Artisanal Taco should be your first stop when dining out in New Jersey. Taco flavors include those filled with hibiscus flower, short rib, steak, and more. Though the tacos are definitely the focus of the menu, Folklore also serves burritos, quesadillas, chilaquiles, and stuffed chili peppers. Chico’s Mexican Grill is a wheelchair-accessible restaurant that aims to serve fresh and delicious Mexican food in a comfortable atmosphere. The menu features flavorful chicken mole enchiladas, ground beef tacos, and traditional tacos al pastor. Menu favorites include the shrimp tacos and tilapia tacos, which are both topped with pineapple salsa and served with rice and beans. A children’s menu is also available at Chico’s to help introduce picky eaters to tasty cuisine. Barrio Costero elevates traditional Mexican food with its delicate plating and seasonal ingredients. Start your meal off with appetizers such as guacamole or platanos followed by a main meal of pulpo with purple sweet potato, ham, and chimichurri. Barrio Costero also offers brunch every Sunday from 10 a.m. until 3 p.m. The brunch creatively fuses traditional American breakfast with Mexican flavors, with dishes such as plantain masa pancakes and steak & eggs. Abril Cocina has received rave reviews on numerous online platforms as well as in the New York Times thanks to its modern take on Mexican food. Abril Cocina is open for brunch, lunch, and dinner. The flavorful tacos are constructed on homemade corn tortillas and features flavors such as pulled pork, brisket, mushroom grilled cheese, and other creative fusion flavors. An entrée highlight is the Mexican bibimbap (a Korean dish), served with rice, guacamole, veggies, a fried egg, and a protein option. La Esperanza serves hearty Mexican fare in a brightly-colored, cozy restaurant decked out with a full bar, ample seating areas, and woven curtains. This family-owned business is an emblem of the owners’ “American dream” thus all of the family is involved in the restaurant in one aspect or another. Home cooked meals include sizzling steak, chicken, and vegetable fajitas, savory tacos, and traditional nopales (cactus) cooked with steak or chicken. Mi Pueblito offers a large range of Mexican specialties with both meat and vegetarian offerings. The menu is incredibly large, with options such as sopes, flautas (similar to a taquito), cemita (a type of sandwich regional to Puebla), tortas, tamales, quesadillas, and more. Prices for individual dishes are very affordable, allowing diners who’d like a little taste of everything the option to order numerous small dishes rather than one large meal. Oasis Mexican Grill offers a small, cozy environment to tuck into freshly-made Mexican food lovingly prepared by the Garcia family. Hearty offerings to keep you full include deep-fried chimichangas, packed burritos topped with sauce, enchiladas, and several taco options. Oasis Mexican Grill also offers the option to order online for your convenience. Orale incorporates seasonal local ingredients into their Mexican dishes and also offers weekly events such as taco Tuesday and “Plate-it-Forward” Wednesdays (where you eat for a good cause). The menu has a great appetizers menu boasting numerous shareable dishes such as duck confit nachos, seared pork belly, and Mexican flat bread. A page full of options for both mains and tacos can also be found, featuring Peking duck tacos, lamb cochinta, vegetarian tacos, and more. Also, don’t overlook their side dishes as the yucca fritta and plantains are both flavorful and traditional. Chapala Grill is a fun spot to go with friends or as a family to dine on home cooked Mexican food and sip margaritas made from fresh fruit (for those 21 and over). The menu features all the Mexican favorites, including sizzling fajitas, enchiladas, and tacos, in addition to offering combination platters, so you can sample more than one dish. Don’t forget to save room for dessert, as Chapala Grill boasts nine different dessert options such as flan, tres leches cake, and bunuelo. This neighborhood Mexican joint offers great discounts for students and teachers as well as a vast menu full of all of the typical Mexican fare you know and love. Order some nachos to share among friends or split a quesadilla. Metropolis also has several taco salads on the menu if you are looking for something lighter. Or, if you are looking for a filling yet affordable meal, opt for the taco, burrito, or fajita entrée.